Traveling by bus is very convenient and easy in Kyoto! You can read about the bus system in English here. At the bottom of the page you will see a link to download a PDF of the bus route map. Unless you can print out a large copy at home, I recommend picking a map when you get here, but the PDF version is certainly handy for planning your visit. 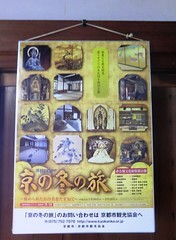 If you look on the bus map, you’ll notice that Ninna-ji is very close to two other temples, Kinkakuji and Ryoanji. All three temples can be accessed from the #59 bus, and if you’re feeling ambitious and the weather is agreeable, Ryoanji is within walking distance from Ninna-ji. Many temples are most easily accessed by bus, so it is a very convenient method of transportation if you would like to visit several temples in one day. There are also several options for flat-fee all day bus or bus and subway passes available. You can buy these passes on the bus or at subway stations.